I have not been able to gather my thoughts and write for a while. I finally got a new used vehicle ( all that took a lot of time and energy) and am just starting to check nests again without the fear of being stranded far from home. Yesterday I went to visit a new homeowner who has a nest in her back yard...the nest is actually not new, but the previous owner who put it up, has moved so I am teaching the new owner about this amazing family she has living in her back yard! When I arrived she was very excited and said I should have been there at 6 a.m. when the chicks were all jumping up and down and hovering in the air. She thought one had fledged. I watched them all for a while...pretty calm, having their morning nap. Then I went up in the attic for a better view of the nest. As soon as my scope was set up one of the chicks took off flying loops and returning to the nest! Indeed, one has fledged! The landings were impressive too. No face plants for this one! Dad watched from a nearby tree, and after a while Mom arrived with a fish! So she is pitching in with the fishing for this family of three chicks, and her crop was full so she is also beginning to care for herself as she prepares for her migration. It was fun to see and fun to share the excitement with this new homeowner as she lives thru her first season of osprey watching. We are also still tallying the losses after the big storm that moved thru on July 18. At least six chicks were lost around that time. We do not have monitors on all nests, (if anyone wants to volunteer) and I was limited by my failing car...so I am still making the rounds and counting heads. I am finding many nests with no adult on them...because we are at the chaotic stage of life, when all the chicks are jumping and flapping, coming and going, and the adults prefer to keep an eye on things from a distance. I try to search for all the adults and chicks....funny to locate chicks in odd spots, like on a nearby chimney stack, and I can't always find them all...so I keep trying, keep visiting. It takes time and a real interest and curiosity to find them all....but in the early days of this reintroduction, that is what my job was...to find them all, and it's a challenge I still enjoy. I wish I had more time. The peace of mind of knowing they are OK is the reward. I also get to see some interesting behaviors while searching for them. One of my new volunteers recently saw an osprey dive for a fish for the first time and come up successfully grasping his dinner , and she was thrilled...these are the gifts that we get when we move away from the nest to observe. Some people still erroneously think that when the chicks fledge, it marks the end of osprey season. But Ospreys are not like songbirds that just fly away one day and that is that. These youngsters will remain dependent upon their parents for food for quite a while...that phase can vary from about ten days to a month or more. 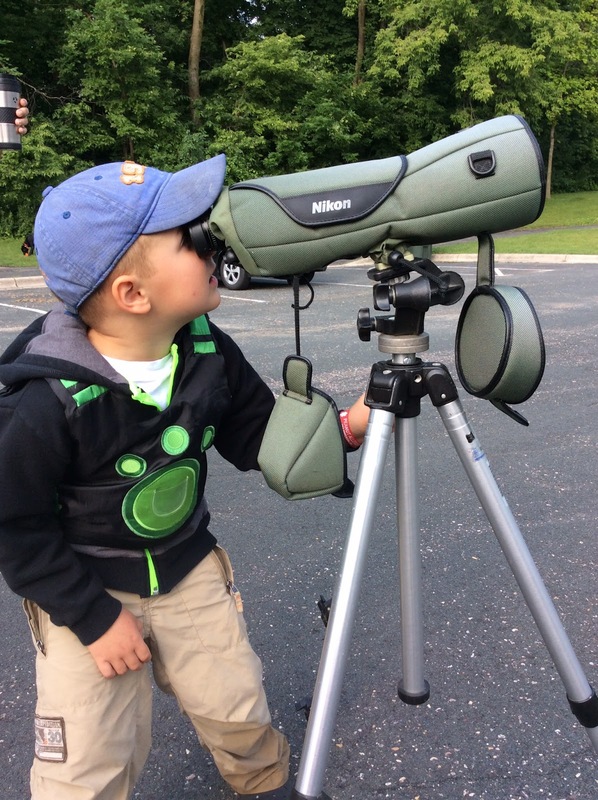 Yes, we still have lots of time to watch our osprey friends...but we may have to search for them! Watch for foot dragging in the water, or trying to go into the water and get lift off out of the water, developing the skills of a real osprey...and yet, still returning to the nest to food beg. 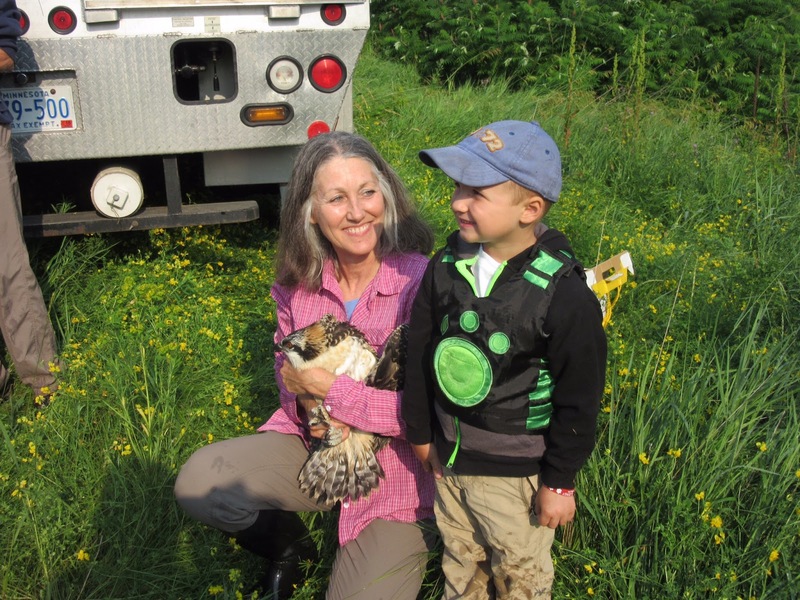 Our chicks have begun fledging in the past few days or week. It is a treacherous time for them and our work as nest monitors becomes more challenging. Ideally, we like to locate all the chicks and be sure they have landed somewhere safely. This is not always easy to do. Some of them will fly a loop and come back to the nest. But some may land in a tree. They spend less and less time at the nest, tho they still return to eat there for a while. Today I searched for two chicks missing from a nest....wandering around their neighborhood, checking the lake....and finally spotting one of them in a tree! Yeah. Then I found the adult female...and sure enough as I examined the tree carefully, the other chick was perched not far from Mom. We are not always this lucky. Some do end up on the ground and they are usually not fed there. The young ones have difficulty getting lift off from the ground so they may die there if we do not rescue them. I often listen carefully....if you hear food begging but it's not coming from a mouth you can see....start searching the ground. They may be uninjured and able to fly if you can set them up on a fence or the branch of a tree....someplace they can jump off of to get going. Sadly the storm that blew thru here Friday night may have cost us some chicks. At least one nest had most of its sticks blown out and the chicks are missing. I am very frustrated this past week or so since my car is failing and I am unable to visit nests as I normally do. What a terrible time to have unreliable wheels. I am shopping for a new used car, a big financial life shock to me right now...and hope to figure this all out and be back to checking nests within a week or two in a new old car! Meanwhile I am asking the monitors to do a little more than usual, if possible, so we can be sure our little winged friends are all right. It can be such an exciting time, watching them fly for the first few times....but also a time that is not without some tragic endings. It's hard for me to be unable to go far from home. When I am out in the field I see so many things that I think would be good to share with you all, and when I get home I often can't figure out what to write about! So many little dramas and interesting behaviors. If you remember, two years ago we had a male who had two families on two nests a few miles apart, each on different sides of the Mississippi River. We have seen cases of polygyny before and usually one nest gets more attention and the other nest fails. But much to our surprise, that male pulled it off that year, successfully raising SIX chicks on two nests! Plus providing for two females. The following year he decided to stick with one nest and allowed another male to take over the other territory. That male remained on that other nest this year as well. BUT the polygynous male did it again this year. But this time he set up his "mistress", for lack of a better word, on the old nestpole within a few hundred feet of his nest on a transmission tower! These females could see each other. This year, however, the outcome was different. One nest failed, from lack of attention from the male. He was not providing food or sharing the incubation duties on the second nest and tho that female gave it a gallant try, she could not pull it off. Her eggs never hatched and she abandoned the nest attempt. It's interesting to see this particular males tendency towards polygyny. One might expect to see this behavior when there are not enough males around, but our population has grown dramatically and I see many single males out and about, looking for females and territories. It's always fun to observe the aberrations to what might be considered normal behavior. Perhaps the growth of the population just provides more opportunities for these behaviors. This, my friends, is why I am so protective of our Ospreys. This is happening in Florida, but I have seen some pretty bad behavior here too. There are crazy people out there who do intentional harm to birds. It horrifies me. The chicks are growing and some are approaching fledging age, though we still have nests that are just hatching or have quite young chicks on them. 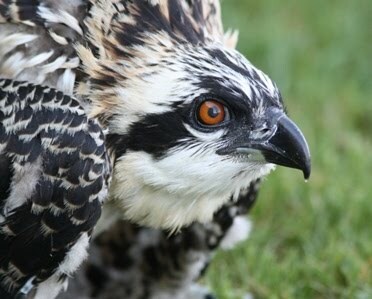 (Every year it seems that some osprey sets a new record here for the latest egg laying!) 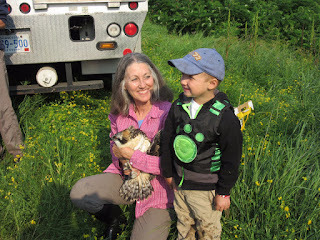 I think our overall numbers will be very good this year since I am seeing so many nests with three chicks. Of course there is a long ways to go and so much can go wrong during the fledging phase. We already have a significant numbers of failed nests, with more to come I suspect. Yesterday I watched some interesting behaviors on one nest with three large chicks, over 5 weeks old. All of them were quietly loafing when the male brought a stick to the nest. All of the nestlings got up and suddenly the smallest chick, with the least feather development, got very tall, neck extended, chest out and he began pushing one of the other, larger, chicks and pecking at her. The large chick just hung her head submissively, drooped her wings and would not move as the smaller chick behaved aggressively towards her. She finally slowly turned away, head down, until she was facing away from the other chick completely. Then she slowly stood up and looked at the other chick intensely. It made me laugh! That just caused the smaller chick to start the chest bumping and pecking again. Then he turned on the other chick as well. The female finally left the nest briefly and all of them laid back down. She came back on the opposite side of the nest, as if to break up the conflict by distraction. The smaller chick had an empty crop while the larger chicks had some food in their crops, so competition for food may have been the issue. This is a nest near an abundant food source and both adults were present today. Always interesting to watch the interactions. The last few weeks seem like a blur...so much happening and it's hard to get around to writing about it all. 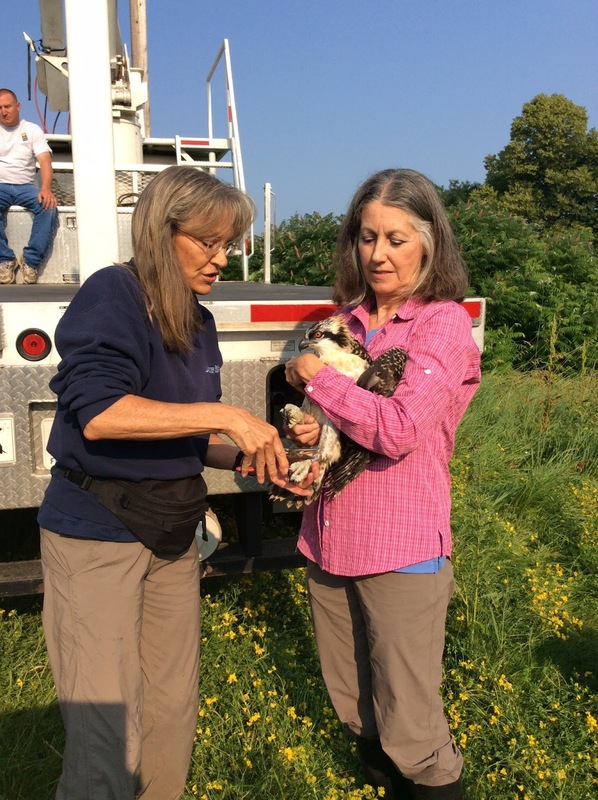 Last week I got to spend another day in the field with one of our great volunteer monitors. I love doing that, watching the birds together, figuring out what is going on, explaining behaviors that I just can't explain in an email. Answering questions, and catching up on our personal lives too. Thanks Alice! Yesterday I also had a chance to meet with a science teacher at a school that has a nest on the ballfield lights so he could view thru my scope and we could talk about the birds. It's so important to make these connections in the community...I wish it happened more. I consider it part of my field work. And I meet such interesting people! This man was breeding homing pigeons and he released a flock of 29 that were "in training". Why didn't I take photos? I was amazed at how moving it was to watch this flock of pure white birds circling above , getting their bearings before they headed home. He told me later they all seemed to have arrived. Thanks Erik! 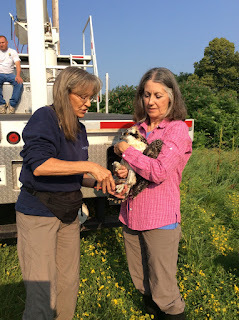 Then I met with a new volunteer monitor who has had past experience on an osprey research project in the 80s....we toured a few nests and talked about the project, (ours and hers) the birds, the politics, and our personal lives. So much fun to introduce my osprey friends to her, since she already understood so much about osprey behavior and clearly, she already loved them! Welcome, Nancy! Of course sprinkled in between all that and the bandings, were my regular nest checks. More nest failures, more head counting....some going up (a little third head popping up! ), and some going down. When new nests pop up at this time of year I have to be careful about identifying the adults when possible, if they are banded. This is when those frustration nests start to be found and if a pair has been counted earlier on another nest, they can't be counted again without artificially inflating the numbers and making it appear as if our population is larger than it really is. When we count nests, we are not really counting how many piles of sticks....we are counting nesting territories, which is really counting nesting pairs of Ospreys. If one or both of the pair has a band and if those bands were read earlier at another nest where eggs were laid, and then after a nest failure for one reason or another, they are seen building another nest, we do NOT count that as another occupied territory. It is just a secondary nest within those birds territory. Now, as we have fewer and fewer banded birds, this gets harder of course, but while we do have banded birds, we need to be careful about this if we are interested in accurate research. Of course it takes time to read bands, but if we have banded birds we sure as heck should be reading those bands! 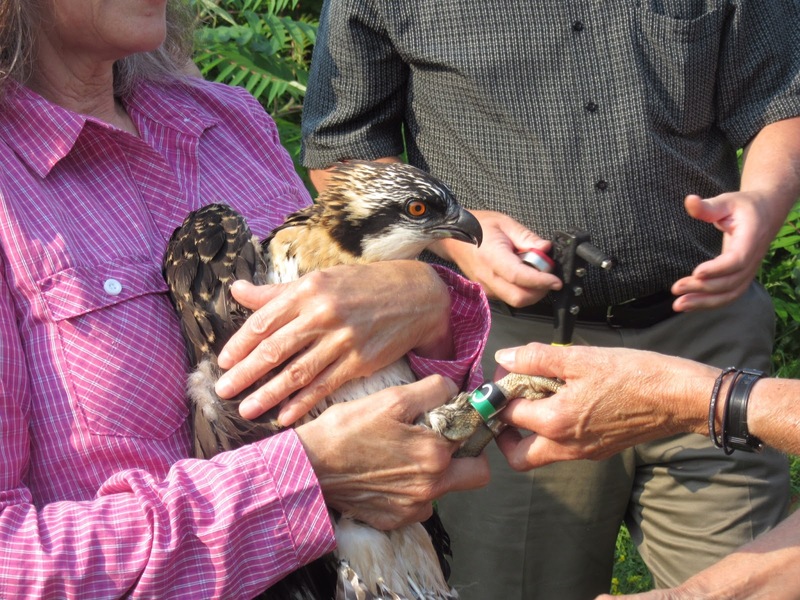 They are there to help us understand Osprey behavior! I keep meaning to write about research methods and terminology....tho it may not be so interesting to some of the people who read this page, I like to do a little educating about all that for the volunteer monitors. It is important. We do need to think about the methods we use, the way we count things and analyze the data. I have learned so much about this topic from one of the best, Sergej Postupalsky, who wrote an important article on this topic many years ago. He studied the Ospreys in Michigan for over 50 years and he has been a mentor to me. He has made me a better scientist! I re read his published papers and his emails all the time. A deep bow of gratitude to him.